To quickly chill the hot cooked tortellini, place a single layer on a wax paper-lined cookie sheet and refrigerate for about 20 minutes. 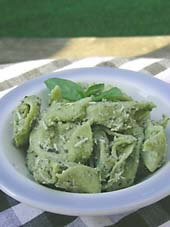 This basil-laced salad makes a nice side dish or light summer supper. Combine everything. Add salt and pepper to taste. This entry was posted on Thursday, September 6th, 2007 at 1:52 pm	and is filed under Master Recipe Index, Side Dishes, Soup & Salad, Speed Queen (30 min/less), Vegetarian. You can follow any responses to this entry through the RSS 2.0 feed. You can leave a response, or trackback from your own site.